Every NOMOS Neomatik watch is flat, automatic, and accurate. Each features a state-of-the-art in-house caliber with NOMOS' proprietary escapement. Their designs range from simple and elegant to youthful and fresh. Almost every NOMOS collection includes Neomatik watches – from the sporty Ahoi to the cosmopolitan Metro and the square Tetra. Each of these watches houses an in-house caliber with NOMOS' own escapement. Highlights include the Tangente Neomatik 41 Update from 2018. This timepiece comes with a date display and the in-house caliber DUW 6101, which is only 3.6 mm thick. What makes this Tangente truly special is its date display: Two red markers frame the current date on a ring around the dial edge. At only 7.9 mm thick, the Tangente Neomatik 41 Update is especially flat for an automatic watch. The Tetra Neomatik is even flatter. Its case height of only 7.3 mm is equal to that of NOMOS' manual watches. What's more, the Tetra's square case makes it particularly eye-catching. Models with a horizontally brushed silvercut dial are especially elegant. On the other hand, the midnight blue version is sportier. Thanks to its exceptionally thin case and simple design, the Tetra makes an ideal dress watch. How much do NOMOS Neomatik watches cost? The Tangente is one of the most coveted and successful NOMOS models. Along with the Tetra, Ludwig, and Orion, it has been part of the German manufacturer's catalog since 1992. Straight lines and Bauhaus-inspired designs define these classic NOMOS timepieces. Alternating Arabic numerals and thin indices are also typical characteristics of NOMOS watches. The look is rounded off by thin hands for the minutes, hours, and small seconds at 6 o'clock. The standard version of the Tangente Neomatik is 35 mm in diameter. It's powered by the automatic in-house caliber DUW 3001, which is only 3.2 mm thick. Thanks to this ultra-thin caliber, the entire watch stands only 6.9 mm high. In terms of the dial, you can choose from white, midnight blue, and champagne. Paired with a matching leather band, the champagne version is rather feminine. Set aside around 2,600 USD for a new Tangente Neomatik. Pre-owned timepieces sell for about 2,300 USD. If you're in the market for a larger watch, you should take a closer look at the 38.5-mm Tangente Neomatik 39 . This model is available with a white, midnight blue, or horizontally brushed "silvercut" dial. A never-worn Tangente Neomatik 39 Silvercut costs about 2,800 USD. The other two editions sit in a similar price range. Pre-owned versions of this watch are still hard to come by. The 40.5-mm Tangente Neomatik 41 Update is both the collection's top model as well as its largest. NOMOS brought this timepiece to the market in 2018. A mint-condition example demands just over 3,100 USD. How much does the NOMOS Orion Neomatik cost? The Orion has been an integral part of the NOMOS catalog for over a quarter century. Its design is more minimalist than that of any other watch from this Glashütte-based manufacturer. The most distinctive features of the Orion are its domed sapphire glass, thin hands and indices, and a finely drawn minute scale. Viewed from the side, the Orion nearly resembles a UFO. The cases of the Orion Neomatik are 36, 38.5, or 40.5 mm in diameter. The largest model was presented in 2018 and is powered by the DUW 6101 with a date display at 3 o'clock. You can call this timepiece your own for around 3,100 USD. The Orion Neomatik 39 is available with a white, midnight blue, or satin-brushed dial. Set aside around 2,900 USD for the model without a date. Pre-owned pieces cost only slightly less. The 36-mm versions are the least expensive, ranging from 2,300 USD pre-owned to 2,600 USD new. The Autobahn premiered in 2018, making it one of the youngest models in the NOMOS catalog. The most eye-catching detail of these 41-mm sports watches are the eight luminous boxes that arch across the dial. A generous coating of SuperLuminova on the hour hand means it's always easy to tell the time, even in the dark. The dial comes in midnight blue, sports gray, or white. Paired with white luminous material, the model with a white dial feels especially clean. Since the NOMOS Autobahn is water resistant to 100 m (10 bar, 328 ft), you can leave it on when you go for a swim. While the Autobahn has an official list price of 4,800 USD, mint-condition timepieces on Chrono24 sell for as little as 3,600 USD. 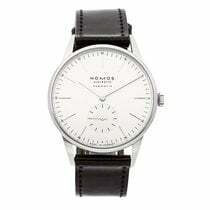 The NOMOS Ahoi is this manufacturer's sports watch. With 200 m (20 bar, 656 ft) of water resistance, it is even suited to diving. Luminous hands and hour markers and a prominent crown underscore the Ahoi's sporty nature. At the same time, the dial and angular lugs are both reminiscent of the Tangente. The Ahoi Neomatik is 36.3 mm in diameter and, thus, the ideal unisex watch. The caliber DUW 3001 powers this watch and lacks a date display. In terms of dial color, you can choose between white, Atlantic blue, siren blue, siren white, or siren red. The three "siren" versions are part of the Aqua series and feel particularly fresh. Prices for a new Ahoi Neomatik sit between 2,900 and 3,100 USD. The NOMOS Metro is meant for city living. Berlin-based designer Mark Braun is responsible for this watch's stunning look. A thin bezel and simple dial with dots marking the hours and minutes define this timepiece's appearance. Since its release in 2014, the Metro has won numerous awards. Each Metro is powered by one of three manual calibers: the Alpha, the DUW 4401, or the DUW 4101. The last two movements both include a date display at 6 o'clock and the NOMOS Swing System – the company's own escapement. An escapement is composed of a balance, balance spring, lever, and escape wheel and is the heart of every mechanical watch. The Metro collection also contains models with the Neomatik caliber DUW 3001. These timepieces are 35 or 38.5 mm in diameter and only slightly more than 8 mm thick. The dial comes in white, champagne, midnight blue, or silver. The collection's highlight is the 18-karat rose gold model on a brown cordovan leather strap. This gold watch demands around 6,900 USD in mint condition. You can get a stainless steel NOMOS Metro Neomatik for about 2,900 USD new and 2,300 USD pre-owned. The 38.5-mm versions each cost about 230 USD more. 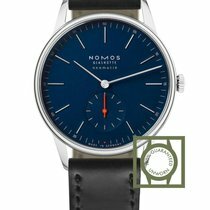 How much does the NOMOS Club Neomatik cost? The Club is yet another NOMOS sports watch. Its fresh and simple design makes it particularly appealing to a younger audience. The Campus models from 2017 were designed with recent graduates in mind and make a wonderful gift to mark one of life's major accomplishments. Many manufacturers have been thinking about the concept of watches as gifts for years. Like the Ahoi and Autobahn, the NOMOS Club Neomatik comes on a textile strap. This only further highlights the Club's sportiness. When it comes to the dial color, you can choose between Atlantic blue, siren blue, siren white, siren red, or white. Its diameter of 37 mm places it squarely in the middle of the Neomatik series in terms of size. New, this watch costs around 2,300 USD. You can find never-worn Club Campus timepieces for under 1,200 USD. Both the standard Club and the Club Campus house the manual Alpha caliber. The Ludwig is NOMOS' most traditional collection. Every watch in this series uses Roman numerals for its hour markers. Some models also feature a classic railroad minute scale. Manual and automatic calibers both appear in the super-flat watches of the Ludwig series. The Ludwig Neomatik is one of the younger members of the Ludwig family and is powered by the automatic caliber DUW 3001 or DUW 6101. The 36-mm Neomatik model comes in white or champagne. Thin black hands display the minutes and hours on the white version, while the small seconds dial at 6 o'clock uses a red hand. The champagne-colored edition has rhodium-plated hands. Prices for mint-condition timepieces sit around 2,600 USD. Pre-owned watches are only slightly less expensive. In 2018, NOMOS added the Ludwig Neomatik 41 Date to the Ludwig Collection. At 40.5 mm, this watch is geared primarily toward larger wrists. The caliber DUW 6101 with a date at 4 o'clock ticks away inside this timepiece. A white dial adds an especially classic and elegant touch. A never-worn Ludwig Neomatik 41 Date costs about 3,100 USD. Older automatic watches in the Ludwig collection use the NOMOS Epsilon caliber. Since the movement alone is 31 mm in diameter, these timepieces measure in at 40 mm. You can get a new Ludwig Automatic for around 2,300 USD. A Ludwig Automatic with a date demands about 2,800 USD. Purchasing a pre-owned model can save you a few hundred dollars. The Tetra stands out from the other watches in the NOMOS catalog. In fact, it's the only non-round NOMOS watch. Instead, the Tetra is square, measuring 33 x 33 mm. The automatic version is the largest Tetra watch. All other models are powered by manual calibers and measure either 27 x 27 mm or 29.5 x 29.5 mm. Due to its size, the Tetra is well-suited for smaller wrists. The NOMOS Tetra Neomatik comes with a white, midnight blue, or satin-brushed dial. Cordovan leather straps keep these timepieces securely on the wrist. Never-worn watches change hands for around 2,800 USD, while pre-owned pieces sell for about 2,300 USD. The midnight blue and silvery satin-brushed models both cost about 120 USD more. The Minimatik is one of the ten models that belong to the limited NOMOS Neomatik 1st Edition series. The first Minimatik models were powered by the DUW 3001 and were available with a white or champagne-colored dial. The white watches feature cyan blue dots as minute indices and red hour, minute, and small seconds hands, while the champagne-colored versions have neon orange minute indices. The Minimatik is now also available in a particularly elegant version with a midnight blue dial. You can call a mint-condition Minimatik your own for around 2,800 USD. Pre-owned examples cost about 230 USD less. The automatic caliber DUW 3001 powers every NOMOS Neomatik model. This caliber's main feature is its thickness. At only 3.2 mm, it's incredibly thin. The manufacturer claims it's one of the world's thinnest automatic movements in series production . The diameter of the in-house caliber is 28.8 mm and it's incredibly precise and efficient. NOMOS regulates the DUW 3001 in six positions. The Swing System, developed by NOMOS in-house, ensures the watch's precision. Of course, the movement has the characteristic Glashütte features, such as tempered screws, a three-quarter plate, and stripes. The movement also has a 42-hour power reserve. The bidirectional rotor winds the mainspring, which stores the energy in the watch, and makes winding the watch much more time efficient. The caliber DUW 6101 is a Neomatik movement with a date display running around its edge. In total, the movement is only 3.6 mm thick and 35.2 mm in diameter. This is why it appears in NOMOS' larger watches. Its date display can be set forward or backward. It also boasts a 42-hour power reserve. Of course, this caliber features the NOMOS Swing System as well. The DUW 6101 has the same typical Glashütte details as the DUW 3001: tempered screws, a three-quarter plate, and stripes.